Help can mean “To give or provide what is necessary to accomplish a task or to satisfy a need”. If one considers this, one may come to the conclusion that anyhow help should come. But as I begin to write this message; it dawned on me that not all help is good and helpful. Help that comes too early may be abused; help that is unwarranted may make one become lazy, and help that comes too late may be useless. Help that is crucial and desirable is the help that is given in time of need. The children of Israel wanted a king like other nations around them, what they didn’t know was that the person God had in mind was still in the making. But because the Israelites were adamant; God allowed Saul for them. He was a help that came too early. Out of the 40 years, he reigned, he had the backing of God for just the first two years. How much suffering did Saul experience? No communication nor directive from God for 38 years. He lost his sons; he lost the throne. He later had to be seeking witches to help him. – May help come to you at the time of need in Jesus name. – May you not be tempted by a help offered to you too early in Jesus name. There is someone here, God has put your feet on a glorious path; you think it’s too slow and you are seeking a faster route. I will advise you to be patient. The owners of this property offered it unto us for £475,000 plus VAT. We were very delightedly when they waived the VAT, especially as Vue Cinema we were using was becoming hostile. We jumped at the offer. It was, however, a help that came too early, as God systematically reduced the figure to £335,000, though it took a bit longer, which was at the time very difficult to bear, but eventually worked in our favour. The extra £140,000 may have taken us another 5 years or more to pay back. – There is someone here, the help you are asking and looking for will come timely for you and not too early in Jesus name. It is possible also that help can come to someone, but too late. It is often said that when there is life, there is hope. But when life is gone, hope is lost too. As I was writing this message, my mind flashed back to a sad incident that happened during my undergraduate days. Even though help came, it was such a help I pray I never received again. It was a help that came too late. – Your help will not be late. May all that is needed to be in place for your help to be timely be personally arranged by God. In Gen. 27:30, Esau was just a few minutes late to catch his brother Jacob been blessed by their father. That sealed his destiny and his descendants forever. If only he got the bushmeat a bit quicker. If only he walked faster. He might just have met them. But it was too late for him. – You will not be too late for your help and helper. Your help and helper will not be too late for you in Jesus name. The widow of Zarephath was a good example of help in time of need. Even Jesus Christ mentioned her story as someone that enjoyed timely help from God. There were many widows in Israel that must have died from the famine; but this widow who was a Zidonian received help just about she was going to eat her last meal! – There is someone here, you used to have savings, but something unexpected happened such that you are now running low on subsistence. Help will come for you. Your supply will not run out. The new provision will meet your old provision. You will not experience an empty state. The bible record the first miracle of Jesus Christ in John 2:1-11. As the merriment continues, word got to Jesus that the wine had finished. They were blessed to have Jesus at the wedding; He didn’t only gave them more drink, but better drink than what they had previously and huge supplies. – There is someone here, there is something regarding you that is about to run out which could bring shame to you. May God multiply whatever it is in Jesus name. Your joy will not run out. Your strength will not run out. Your love will not run out. Your time will not run out. Your resources will not run out. Instead of you to be put to shame; God will turn you into an amazement. Life will progressively get better for you in Jesus name. In Dan 2:1-49; King Nebuchadnezzar dreamt and could not remember. He asked all his wise men, sorcerers, astrologers, magicians, etc to tell him the dream and the interpretation, or else they will be cut in pieces and their house turned into dunghill. Daniel and his three friends were grouped amongst these people. Shockingly, the execution was to start from them, even though they were already some in the palace (vs 12-13). But guess what? It was a Divine drama to elevate Daniel and to bring glory to God. Daniel was able to negotiate time with a king who was already furious and had issued a decree. Such that the king accepted. There is someone here, there is a challenging circumstance confronting you now, I am asked to tell you that it’s only a drama. It will not only go away; it will elevate you and also bring glory to God. – There is someone here, God says I will take you to a level where even kings will revere you. Moses was born at a very difficult time in history for boys. His parents miraculously hid him for three months after his birth; but it got to a time that only timely help from God could save him. As Miriam put Moses basket in the River Nile, it was either crocodiles and snakes would eat him or an Egyptian would take him to be slain. The only house that could guarantee Moses continuos existence was Pharaoh’s palace. So God arranged Pharaoh’s daughter to see Moses first. Moses intended killers preserved his life. – May your life and those of your loved ones be preserved in a timely manner. There is someone here, you were born or raised in a disadvantaged situation and that has majorly defined your identity. I hear that the embargo of that disadvantage is now lifted. You will become a great deliverer. You will not go like others. Your case will be special. After 31/2 years of ministry, Jesus was going to be killed soon, he decided to travel to Jerusalem through Jericho. It was a trip that brought help in time of need to a man called Bartimeus. He would have died as a blind beggar (Mk. 10:46-52). – Help is coming your way. Help that will overhaul your destiny is coming. You will not look into the hands to man to survive. You will be known as a proven follower of Christ. As the compass responds to the magnetic north, so your life shall magnetise timely help from Me. This anointing will not allow you to be late for help. It will make you a ready candidate to be located by Divine help. Your life shall magnetise Divine help. We pray that we don’t suffer from trouble. But for every man, there is a day of trouble. Solomon was a man of peace. But a day of trouble came in his life, only a timely help from God saved him. God inspired Prophet Nathan to help him. Father, in any day of my life that trouble shows up, please send help to me. Life has been said to be many things. One of such is battle. You are either fighting one, about to start one, or just come out of one. 3 types of attackers: weaker, equal, stronger. Father, in all the battles I fight in life, please defend me. Help is good. But there are levels of help. Small, medium and large. Daniel was praying and help was sent through Gabriel. But Lucifer blocked him. Michael had to come to the rescue. If Michael had come first, 21 days would not have been wasted. Father, send me help from your sanctuary. Send me help from Zion. 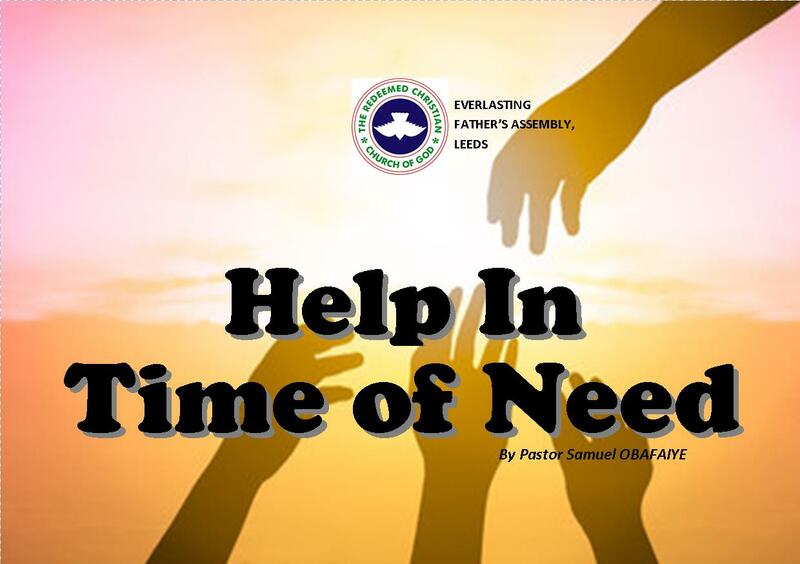 The sermon, Help In Time Of Need, by Pastor Samuel Obafaiye, was delivered on March 25, 2018 on tehAnointing Sunday.